If there’s one industry that you might expect to struggle on emerging channels such as mobile, it is luxury retail. After all, a huge amount of the experience revolves around real-world experiences and interactions. Are customers really going to buy top-end items without the opportunity to try them on, check them out, and generally feel pampered by the whole experience? The short answer to that question (as you may have already guessed) is ‘yes’. The longer answer is that it will only happen under the right circumstances. Get it wrong and the move to digital and mobile can do more harm than good to organizations for whom brand equity is not just a nice to have - it’s absolutely everything. The hesitation that you might expect when the stakes are so high is evidenced by the fact that many luxury brands and retailers have remained suspicious of online retail in any form - to the extent of only hesitantly dipping a toe in the water in recent years. But that’s probably not a long term strategy - and certainly not since 2015 when even Chanel decided to allow customers to buy online. This should be obvious, but there’s no harm in repeating it. Luxury brands cannot cut corners when it comes to the direct experience. Go beyond simple online presence and take advantage of the capabilities of the native mobile app. Dior - shown below - is a perfect example of a company that really understands this. Their mobile presence includes both a magazine and TV app. Each includes a range of interactive content that helps customers (and potential customers) really get ‘inside’ the brand. Even if you aren’t necessarily going this far, it stands to reason that if you’re asking your customers to spend significant amounts via mobile and other digital channels, you want to give them the best possible opportunity to ‘feel’ the product. That means communicating the quality, which in turn means investing in art and photography to match - and testing to establish what works. It would be easy to dismiss the small screen of mobile as fundamentally unsuited to luxury retail. But that would be to make the admittedly common error of assuming consumers interact with each channel independently of each other. That is not the case. Digital channels, for example, influence two thirds of spending in bricks-and-mortar stores. And of course that relationship works both ways - those fabulous in-store experiences we spoke about earlier can lead to purchases on mobile and other digital channels in future. So don’t assume that one channel has to ‘do it all’. Remind yourself that your potential customer may already have seen and handled that handbag and be more than willing to arrange the purchase via mobile. In a similar vein, it may be worth connecting up in-store and mobile channels using location-triggered campaigns that add depth to the bricks-and-mortar experience. That might be via digital shopping assistants, store or product locators, or asking for feedback when customers leave the store - test and optimize as many campaigns as you like! Emerging channels mean new opportunities. Smart retailers consider the possibilities of those channels and respond accordingly. Take the rise of digital media streaming via OTT channels. This technology enables brands to take their place on the TV screen, accessed via the app available via the streaming partner. For the types of aspirational brands that characterise the luxury sector, that’s a fantastic opportunity to build a personal relationship in a whole new environment. 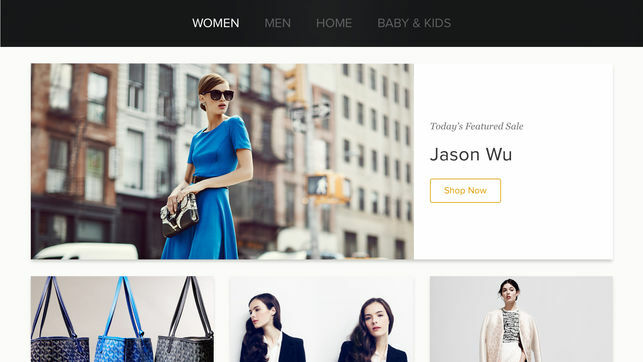 Gilt, the luxury retailer, has taken this approach with great success. Embracing this opportunity means effectively creating an entire interactive experience (including video of course) that provides everything luxury shoppers need - including the opportunity to purchase right there and then. It would have been easy to either ignore (or perhaps more accurately not identify) the opportunity altogether, or simply have translated mobile or web content onto TV. By rethinking the experience entirely, Gilt have created what is effectively an entire new channel for their business. Last but not least, always remember to provide reassurance to digital customers, including those on mobile and other emerging channels. Despite your best efforts, in most cases it does remain a process of buying ‘sight unseen’ - and there are ways to reassure customers when that is the case. Provide the ability to speak with an individual at any stage in the process, not only using live chat, but also if necessary on the phone. UK retailer The Wine Society, for example, provide a phone concierge available to advise any member at any time on potential purchases. And ensure that, if things don’t work out, any returns policy is hassle-free. Consumers are always more likely to buy if they know they can return (for any reason) easily.